Pinot Bianco is an international vine that’s widespread in Burgundy and Germany. It is found in the Colli Friulani territory, one of Italy’s most famous wine-producing areas, whose characteristics enhance this grape’s typical qualities: great structure, good body and an interesting level of acidity. 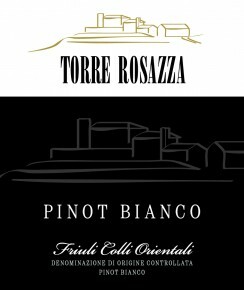 A very small production at Torre Rosazza delivered an award-winning wine only in its second vintage. Aromas of fragrant spring blossom, orchard fruit, hazelnut and bread crust lead the nose on this refined white. The elegantly structured palate offers creamy yellow apple, lemon drop and mineral alongside crisp acidity that leaves a tangy finish. This is a great wine for starters, risotto, savory soups or pasta and sliced raw fish. It matches well with oven-roasted pullets and stuffed pheasant. Whole grapes are placed in the press, where they are softly squeezed. Traditional white-wine vinification in stainless steel vats at controlled temperature. Partial malolactic fermentation is then carried out. The wine rests on yeasts for about 6 months in steel tanks, and then 2 months in bottle.